This magnificent contemporary villa boasts bright and spacious dimensions, innovative design and stunning views over the shoreline. With a wealth of space, style and unique features this property is sure to impress even the most discerning guests. 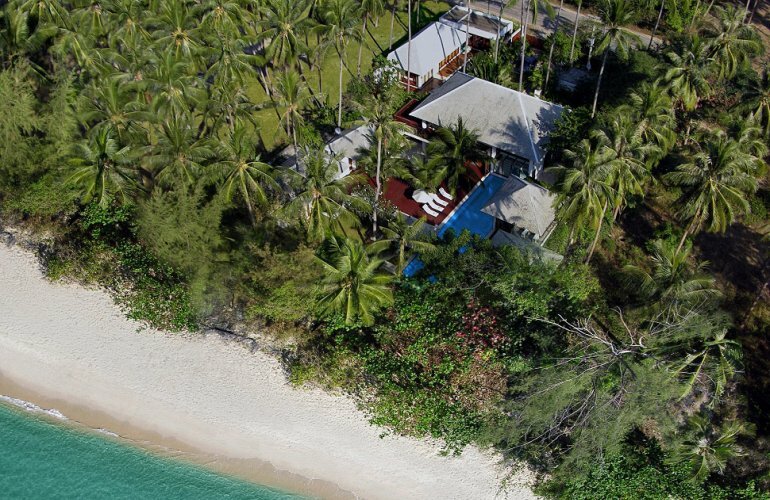 Built on a huge beachfront plot with views over Angthong Marine Park this creatively designed villa boasts super stylish living in a tropical island setting. The property consists of a living pavilion, six private en-suite bedrooms, a gymnasium and games annex, an impressive pool area and a whole host of unique features and fittings. Swathed almost exclusively in white the expansive two-storey living pavilion hails plenty of light open-plan living space and an eclectic mix of modern furnishings and retro accessories. There are two lounge areas on the ground floor; a sunken den/library with white sofas, lively cushions, a glass coffee table and a wide aquarium window looking under the swimming pool. The second lounge is a glass-walled television room featuring comfortable furnishings, colourful accessories, a large LCD TV and DVD, a vast DVD library, a Nintendo Wii and Sony PlayStation. The ultra-modern kitchen features white units, a central island, a breakfast bar and contemporary fittings – this is the perfect place for the resident chef to prepare meals using freshly grown vegetables, herbs and fruits from the villa’s own kitchen garden. The kitchen serves a large open-plan dining area at the centre of the living pavilion with high double-vaulted ceilings, a large glass-topped table with seating for up to 16 and a nearby fully-stocked bar area. Cantilever stairs lead up to an impressive mezzanine lounge featuring designer furnishings and bright artworks, a large mezzanine terrace with bar and pool table and a private study area with iMac computer, iPod dock and wireless broadband internet. The living pavilion also boasts a professional fully-equipped spa room for in-villa treatments and massages with additional massage areas located throughout the home. Glass doors open out from the downstairs dining area to a resort-style swimming pool with swim-up bar. Flanking the pool is a palm fringed sun deck furnished with luxury sun loungers and white parasols. The impressive outside space also features an additional plunge pool ideal for kids, a poolside BBQ, tropical hammocks and direct access to the beach via the palm-fringed lawn. The villa also boasts an outdoor movie theatre, massage salas and a beachfront tree house with sun deck. State-of the-art speakers are located around the indoor and outdoor living areas with over 6000 iPod tunes available to play. A gymnasium and games annex and can be accessed from the poolside; the gym is equipped with weights, fit balls, a rowing machine, stepper, punch bag and more, it also offers direct access to the kid’s pool deck, a shower and WC. The games room features a TV, DVD, table tennis table, board games and a sofa bed. A twin bedroom ideal for kids or singles is located in the games annex with twin beds, additional roll out beds and an en-suite bath and shower room. Four further en-suite bedrooms are located in two separate pavilions around the poolside, each featuring its own fabulous luxuries including designer interiors, fantastic sea views, outside showers and baths and access to the pool deck. One room has an additional lounge area and a designated massage and bath area with access to a secret cactus garden. All six bedrooms are en-suite and equipped with personal safes, hairdryers, robes and slippers, TV & DVD’s and iPod speakers. A selection of restaurants and bars including the renowned Nikki Beach Club are close by.